Cook pasta according to package directions. Drain pasta, rinse with cold water, and drain again. Set aside. Meanwhile, in a small food processor, combine spinach, basil, garlic, cheese, salt and pepper. Add oil and the water; cover and process until nearly smooth and mixture forms a paste. (Scrape sides of container frequently.) Combine the mayonnaise with the spinach paste. Add to pasta and toss until well coated. Chill, covered, for at least 4 hours or up to 24 hours. 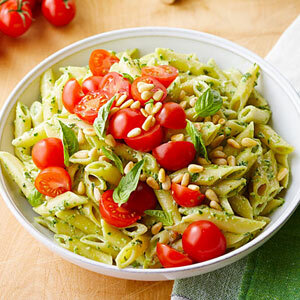 Before serving, top salad with cherry tomatoes and toasted pine nuts.